Sherman O. Canapp , DVM, MS, CCRT, Diplomate ACVS, Orthopedic Surgery & Sports Medicine. Dr. Canapp is a member of the American College of Veterinary Surgeons and has completed his certification in Canine Rehabilitation. He publishes and lectures frequently on the subjects such as osteoarthritis, sports medicine, rehabilitation therapy and minimally invasive surgery. In 2007, Dr. Canapp was elected as the founding president of the American Association of Rehabilitation Veterinarians (AARV). Dr. Canapp’s current and upcoming research studies include the use of functional hinged stifle braces for cranial cruciate ligament injury; diagnostic joint blocking; therapeutic ultrasound on the healing of TPLOs; and the effects of Pentosan Sulfate as well as MSM for the treatment of osteoarthritis. Imagine that your dog is favoring a rear leg and occasionally off-loads, sloppy sits with the leg out to the side, or even holds the leg up as he/she tries to run. You would probably take your dog to see your veterinarian. Eventually, you learn that your dog has injured its cranial cruciate ligament (CCL), the canine equivalent of the anterior cruciate ligament (ACL) in the human knee. A tear of the CCL ligament is the leading orthopedic injury in dogs. Traditionally, the pet owner has had only one option for CCL injury – surgery. Without surgery, the stifle would remain unstable which may lead to a progression of osteoarthritis, pain, dysfunction, muscle atrophy and even meniscal injury. In addition, the chance of injuring the CCL on the opposite hind limb is further increased because of the increased load on that stifle from compensation. There is now a second option gaining attention – the custom-made orthopedic brace (aka “orthosis”). Surgeons and therapists frequently recommend clients consider a custom-made orthopedic brace when surgery is not an option or as an adjunct to surgery. These devices along with appropriate rehabilitation therapy have helped treat many orthopedic conditions and injuries with great success, with and without surgical intervention. 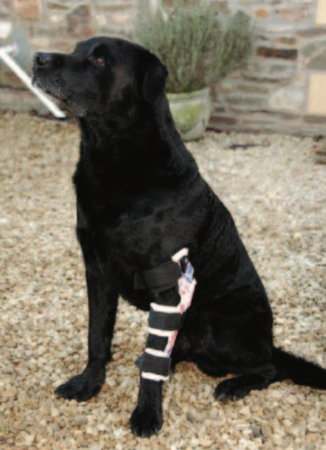 When Is Your Dog A Good Candidate for A Custom Orthopedic Brace? Some dogs are good candidates for braces because of their advanced age. Certain dogs cannot handle general anesthesia due to concurrent medical conditions, therefore surgery is not an option. Generally, braces will be significantly less expensive than surgery. • dogs that have undergone surgery and require additional support or protection of the repair (medial collateral ligament repairs; patellar tendon repairs, etc) as they progress through rehab. The braces shown here are for various orthopedic conditions. 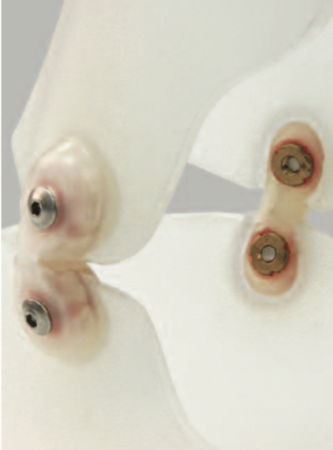 The braces are articulated, i.e., they have joints that connect an upper and lower portion. The joints are Tamarack® Flexure JointsTM and are designed to mimic the action of a healthy knee and help offload it. Flexure joints are commonly used in human orthopedic braces. 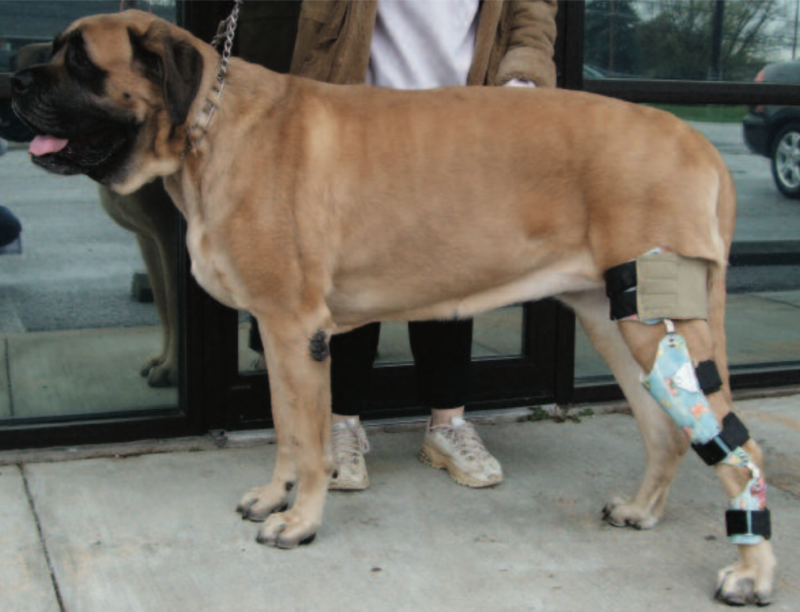 To make the brace, your veterinary clinic or rehabilitation therapy center will typically make a cast of the injured leg. The clinic/center will then have a brace made by an orthotic-prosthetic clinic. Because the brace is custom, it will fit the unique size and shape of your dog’s leg. Your veterinarian or rehabilitation therapist should be able to help you ensure the brace fits properly. There is a break-in period to allow the dog to get accustomed to the brace. 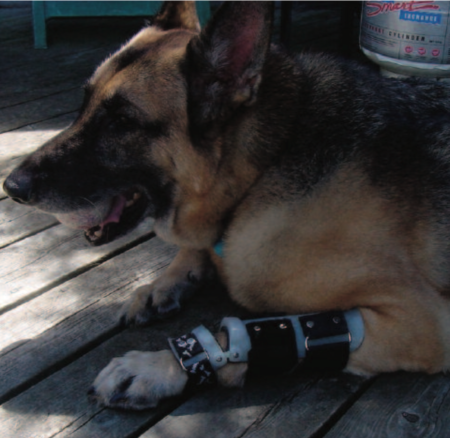 Most dogs adapt to orthopedic braces within days to weeks. If the device is worn and broken in properly, most animals experience very few complications because of the custom fit. Objective gait analysis has shown that dogs continue to increase their stride length and weight-bearing pressures as they become accustomed to the braces. 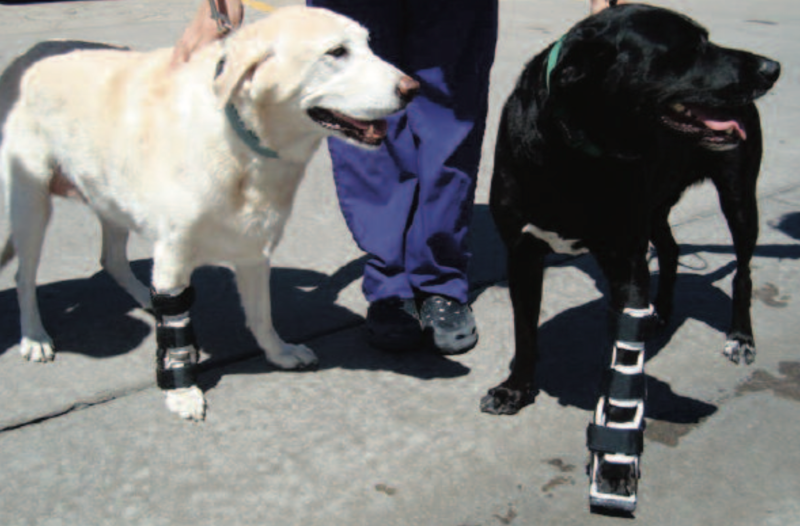 The custom-made orthopedic brace (“orthosis”) is a device that can be used to treat orthopedic injuries such as canine stifle injuries with great success. It can be used as an alternative to surgery or in other cases as part of a post-surgery rehabilitation program or when surgery is delayed. It is important to remember that appropriate rehabilitation therapy and medical management is also recommended.